I have read The Musician’s Toolbox and am very impressed with its content. I am happy to endorse this book. It is rare to find an easy to read, highly informative collection of helpful hints and creative ideas in one publication, but The Musician’s Toolbox by Diane and Nick Petrella is such a find. Divided into sections focused on teaching, learning, performing, general and health and wellness, the 111 tools, each of which includes suggested projects to put the tools into action, are practical action-oriented activities that will stimulate the growth of every musician. This is a publication you’ll keep going back to when you want to restart your engine. The Musician’s Toolbox oozes with short, sharp and totally invaluable “tools.” The target audience for this publication is EVERYONE simply because we can relate to the “tools” even beyond the world of music. Whether you are embarking on your first percussion lesson or you are the leader of the Chicago Symphony Orchestra, read this book! The realistic and practical action plans are brilliant – they totally enhance our lateral and independent thinking skills, and the fun of just being curious. There is no doubt that this book will enhance all we do as musicians and as human beings. 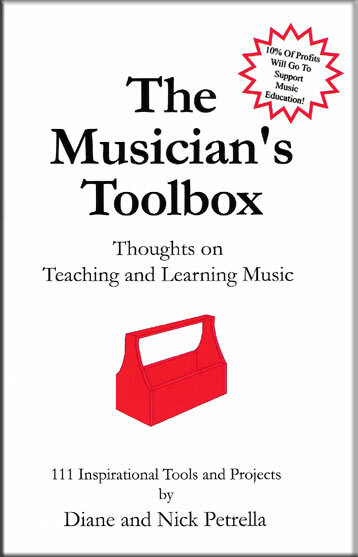 The Musician’s Toolbox is full of practical ideas to help you succeed in the classroom as well as in life. There is real “take-home” value for everyone. The Musician’s Toolbox is an idea whose time has come. Diane and Nick Petrella have efficiently and effectively created a blueprint-of-success for anyone and everyone interested in the art of music-making, music-teaching, and music-learning. Each of the 111 tools will generate an “AHA” moment for the reader. From basic pragmatic suggestions (“How to use a metronome”) to philosophical introspection (“Remember your reactions to different teaching styles”), the content is relevant, timely, and valuable. It’s a MUST READ for all. When I first saw The Musician’s Toolbox, I smiled and nodded my head. The concepts in this book, and especially the toolbox analogy fit 100% into my philosophy of teaching. Our American Band College masters degree program for band directors does exactly what this book does: It provides a logical vehicle for the mastery of tool after tool. The way in which that can be presented guarantees that the student will master the tools in a small box and then gradually need a much bigger box in which to keep all the new tools obtained. A wise man once said “one action was worth 1000 conferences.” If this is true, then the Musician’s Toolbox is like a notebook filled with all the great “action ideas” from those conference sessions… multiplied by 100! The Musician’s Toolbox is packed with practical, applicable, real world strategies to help any musician/music educator succeed on his or her career path. Diane and Nick Petrella have created a long overdue guide that will certainly become an important resource for most musicians for years to come. Diane and Nick Petrella have compiled an impressive and practical guide of do’s and don’ts (111 of them to be precise) for everyone from the novice to the experienced musician. Also included is a comprehensive list of international music organizations. The Musicians Toolbox is a “must have” for every musician’s library. This book truly is a toolbox filled with great insight for the very beginner to the very experienced musician of all ages. It is the compilation of two excellent musicians’ recognition of the many challenges musicians face as they develop proficiency in their specific instrument and also in life as a student, teacher, and professional. The Musician’s Toolbox applies to anyone desiring to participate in the joy of playing music. © 2017 Nick Petrella, all rights reserved.